As promised in my recent Instagram Catch Up post, I decided to post my outfit that went with my Makeup of the Day! 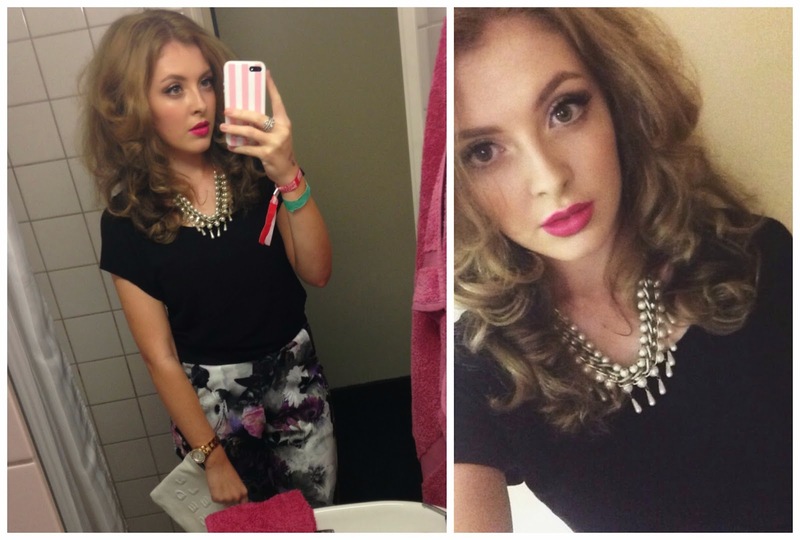 This was from September when I went on a night out for Freshers, so I wanted it to not be too dressy. I wore my favourite black tee from H&M with these amazing pants from Missguided. I saw them on Sarah Ashcroft's blog, and fell in love with them, as they definitely add a chic edge to an outfit and are a great alternative to a skirt/dress! Plus they're a bargain at only £14.99! Accessories wise, I wore this silver and pearl necklace from Dorothy Perkins (very old so no link I'm afraid!) and my favourite Zara 'Stressed But Well Dressed' clutch - a spot by my boyfriend in a Zara in London months ago when everyone was going crazy for it. I love how big it is as I'm always the one who has to take everything but the kitchen sink out with them haha, so this is perfect. I know Missguided and Boohoo have done similar ones if you want to pick one up yourself! If I'm totally honest, I can't remember much about my makeup - I think I wore MAC's Face and Body Foundation, Ardell Demi Wispies (cut in half) and Rebel lipstick from MAC, but that's about it! I think it complemented the purples in the pants really nicely though!